Microsoft’s original Xbox was regarded curiously by gamers and the press alike at launch. It was bigger, bulkier, and featured an eldritch monstrosity as its original controller. Thankfully, Microsoft saw fit to improve things later in the console’s lifespan with the Controller S, but nothing quite compares to the simple glory of the Xbox 360 controller. Now, there’s a way to use one on your original Xbox. This project is the work of [Ryzee119], who previously adapted the controller for use with the Nintendo 64. 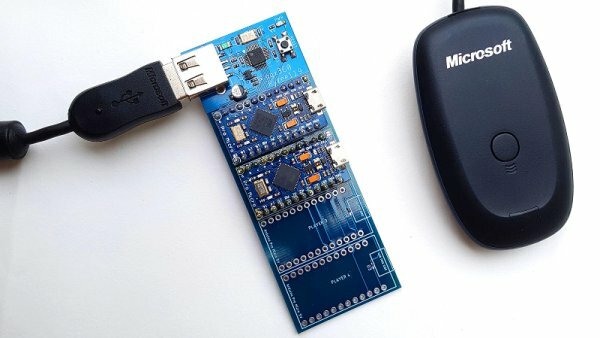 An Arduino Pro Micro, acting as a master controller, talks to a MAX3421 USB host controller, which interfaces with an Xbox 360 wireless receiver, either genuine or third-party. The Arduino reads the data from the wireless receiver and then emulates a standard controller to the original Xbox. The system can handle up to four players on wireless 360 controllers, requiring an extra Arduino per controller to act in slave mode and emulate the signals to the original Xbox. In testing, lag appears roughly comparable with an original wired controller. This is a particularly important consideration for fast-paced action games or anything rhythm based. It’s a well executed, fully featured project that should improve your weekly Halo 2 LAN parties immensely. No more shall Greg trip over a controller cable, spilling Doritos and Mountain Dew on your shagpile carpeting. Video after the break.